Troitske, Luhansk Oblast, 9 August 2018 – A newly refurbished Administrative Service Centre in Troitske, Luhansk Oblast, will help the government be more effective and efficient in the delivery of administrative and social services to over 14,000 citizens of the Troitske amalgamated territorial community. 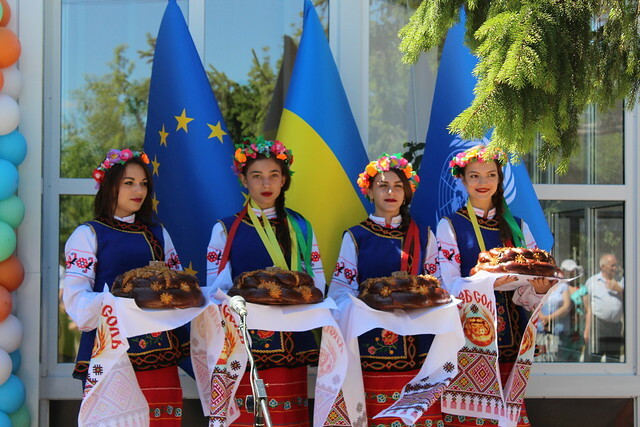 The premises and equipment of the Administrative Service Centre (ASC) in Troitske were overhauled as part of UNDP's Recovery and Peacebuilding Programme, with financial support from the European Union. With the support of an EU grant, the centre was overhauled and equipped with furniture and equipment for seven specialists. A visitors’ waiting zone, children’s area, archive and a boiler room were equipped, and a data server was installed. “The opening of this centre is the result of the joint efforts of all partners – the local community, the regional state administration, and the European Union, which provided the necessary funding,” said Victor Munteanu, the manager of UNDP’s Recovery and Peacebuilding Programme. “The centre is to provide the community residents quality services right in their neighbourhood. It’s also a place where their neighbours, friends and children can work, and this will contribute to building stronger social ties and community development,” Munteanu added. The total cost of the project was almost USD 60,000, and community members pitched in to help with work to improve the public landscaping around the centre, as well as to carry out roof repairs and install heat insulation in the building, using budget funds. “The fact that Troitske now has its own Administrative Service Centre makes this community one of the leaders in providing administrative services in Luhansk Oblast,” said Demyd Palahno, head of the Troiske territorial community. “The centre is now providing 95 services. We’re excited that we’ve managed to implement this project together,” Palahno said. The EU/UNDP held training sessions for the ASC staff members to help improve their working skills and the quality of services they provide to over 14,000 citizens of Troitske territorial community. The Troitske amalgamated territorial community is comprised of 39 settlements with the population of 14 151 (including 1963 children). In total, from June 2017 till now, 10 ASCs were opened in Luhansk Oblast, with UNDP’s support. The carrying out of major repairs and purchase of new equipment for the ASC were made possible by the Troitske Town Council and the “Kalyna-Press” NGO, within the framework of the joint UNDP-UN Women project “Restoration of Governance in Crisis-Affected Communities of Ukraine.”. The project is funded by the European Union as part of the UNDP’s Recovery and Peacebuilding Programme.